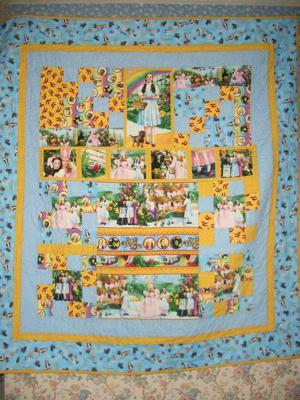 The second collection of Wizard of OZ fabrics tells the story of Dorothy and Toto landing in Munchkin Land. The Good With Glenda is the star of this series. She is exquisite! Also the munchkins and the Mayor are so lifelike. You can just see those little guys doing their Lollipop dance. The full color in this portion of the movie is so important after the sepia tones in the beginning section. All is bright, happy and very clean looking. The red shoes really seem to sparkle on the fabric. I have used the panel in sections and have overlaid the black divisions in the film scenes with the Yellow Brick Road fabric. I like the way it kept the quilt all light and happy. The border fabric is called Dorothy Toss, with Dorothy, Toto, rainbows and red shoes going in all directions. Lots of motion in that fabric makes an interesting border. I know I seem to be obsessed with these fabrics. I AM! !Lots of fun to make these!!! Thank you for viewing my quilts. The bag you made sounds really cute. I bet she will get lots of nice comments from those who see it. Thanks for the comment on my Over The Rainbow quilt. I made my daughter a bag to carry to her dialist 3X a week and used the Glenda, the good witch panel. I lined it with the blue "Surrender Dorothy" fabric. I think it turned out beautiful.